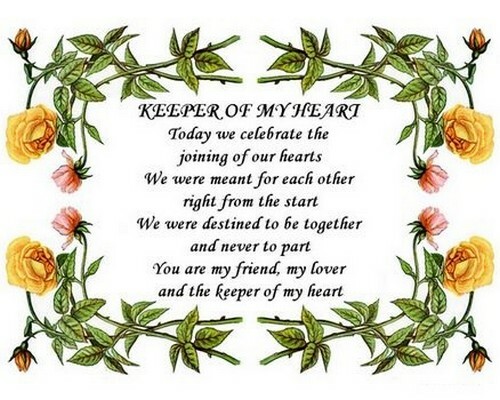 Love is not about clichés and formal greetings and all that but still each year you find yourself in a position to celebrate anniversary and you really feel like making your partner happier. Yesterday, today, tomorrow and forever with you. Happy anniversary, darling. You are my love boat captain who guides me over the sea of life year after year. Happy anniversary. You make years pass like an eye blink and still feel eternal. Thank you for sharing time with me, my love. Full of surprises that fill my life with pleasure, you bring me love and passion year after year. I love you. Each year with you brings me more love, success and happiness than the previous one. I adore you. May the years before us remain new adventures which will keep our love fresh and our relationship strong. Happy anniversary. While we celebrate another year of love and happiness, let this day gives us nothing but joy! The most beautiful woman in the world, you give me strength and remain my true love year after year. I hope our marriage will always be exciting and joyful – just like the last 365 days of our lives! Happy anniversary, honey. We have but one life to live and one heart to give. I am glad that I gave it all to you, my love. Today will tomorrow become yesterday so let’s enjoy it while we can! Happy anniversary! Thank you for the good times you create and thank you for making the bad times easier. Thank you for being with me, my dear. Marriage is like a peaceful harbor – every little wave that comes to it only shows how strong our harbor has become. Happy anniversary. I love you truly, madly, deeply. I love you blindly and overwhelmingly. I loved you last year just like I love you this year. But today I love you especially. We search for love and stop when we find it. I salute to the day when I found my true love! With you I always find the right way and the best solutions. You are my piece of mind. Happy anniversary. If I could meet you one more time, I would fall in love again. And I fall in love again today. My life makes more sense since you married me. 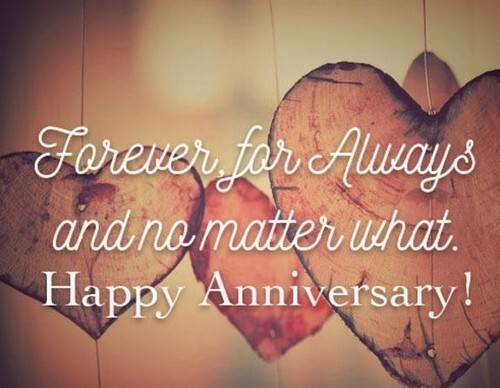 Happy anniversary, dear. When I was young, I used to dream of true love and all the pleasure it brings to a man. On this day, my dreams have come true forever. Last night I dreamt that my angel is gone but this morning I woke up happy to find him next to me. And I am happy for I’ll keep finding him next to me in the years to come. Your smile still drives me crazy, your beauty still makes me tremble. I love you like the first day I saw you. Our marriage is the beautiful knot that keeps me bound to the person I love. Happy anniversary, darling. Your voice is heavenly and your look is celestial today. As it has always been, my dear. Sometimes you are my fiercest enemy and sometimes I can’t stand you but all the time I love you. And I always will! Whatever happens in life, do not be afraid to tell the person you married. And can I tell you that love happened to me on this day. Happy anniversary. I always wanted nothing from you but yourself. You are my one and only love – you are everything. Big love stories have always been about drama, farce and tension. This day gave me my true love and now I know it is all about peace and affection that you bring me. I might not always want to do the same things in my life, do the same job or play the same sport. But I know that I will always want to be close to you. Happy anniversary. You make me laugh, you make me confident, you make me strong and you make me kind. You make me a better person year after year. When I take a look back and think about my life for a minute, there is little to see but you. You are the world to me, my dear. When I listen to our first dance wedding song, I think about the happiness I felt that day. And this happiness still makes me feel like dancing! Happy wedding anniversary. When I was a young man, I thought money will buy me happiness one day. Now I am a big man and I know that happiness is not a thing to buy, it is a woman you marry. I loved you from the first time I saw you and couldn’t take my eyes off of you ever since. And in your eyes I saw your soul and knew you would always be my soul mate. Happy anniversary! Small parts give bigger picture and the bigger picture of my life is you. All love all parts of you, honey. We all change one way or another over years but what I remember being always the same is this great love between the two of you. Happy anniversary. Some say that love is fading over time but I see that your love is like the Sun – growing bigger year after year. Happy anniversary. Marriage is not about making your partner perfect, it is about being perfect for each other. I am glad to see that kind of perfection in your beautiful marriage. 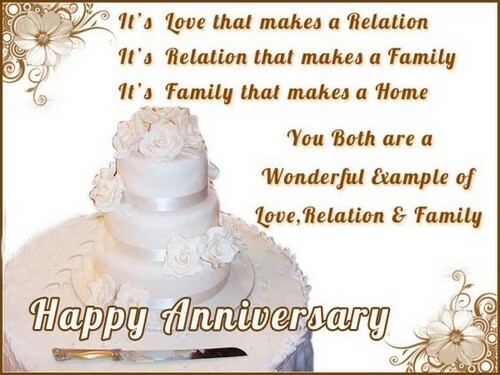 Marriage anniversary is celebrated each year but I am glad to see that you celebrate the love you share day in and day out. Happy anniversary. Couples sometimes have misunderstandings, make mistakes and even argue and fight. But once I get to think about it, I am delightful to know that your marriage is peaceful like a river flow. When you were young you used to live fast and make exciting adventures and take fabulous journeys. Congratulations on still keeping it possible! When I see the two of you, I am always both happy and jealous – you make a perfect couple but an elusive goal for everyone else. Happy anniversary. Your love sometimes resembles a short sci-fi story, sometimes it looks like a romantic poem but most of the time it feel like a perfect love novel. Enjoy your pages of love! Some years are simply extraordinary but you two live like each one of your days is totally unique! Happy anniversary, dear friends. Your marriage is like the Sun and your kids like the planets around it – I am thrilled to see the solar system of your life expanding from year to year! Happy anniversary. You guys prove that love is the only thing that is not reducing while giving. Keep sharing love! You grow older but your love seems to resist time – it looks younger each year. Happy anniversary. Your marriage is indeed inspiring and I hope it will continue to be like that forever. Happy anniversary! There is no problem that you can’t solve together or life battle that you can’t win when you join forces. Stay strong in your love, dear friends. If someone was smart enough to use your love as a screenplay template, he/she would make hell of a love movie! Happy anniversary. The music of your love is awe inspiring and makes me feel like dancing in that very same rhythm. Happy anniversary, my friends! Each challenge you overcome in your lives gives you more motive to continue and more reasons to celebrate days like this one. Enjoy your own special day. Sometimes you feel like a normal couple but more often you don’t. But you two always feel like being perfect for each other. People think that ideal marriages are meant to be but I know how hard you work to make it possible. I wish you never stop working that hard! Love is a complicated game and not everyone can figure out its rules. But this year once again proved that you are professionals in this game. May each New year in your marriage bring you twice as much happiness as the preceding one. You deserve it, my friends! We had some easy times together and we had some difficult times together. But I am glad to know that all of these were our times, my love. I wish life will bring you happiness you could not even dream of! Happy anniversary! Your marriage lasts longer based on your love that flows deeper and deeper with each passing year. I love you as my best friends and good persons but today I love you because you are such a tremendous couple. 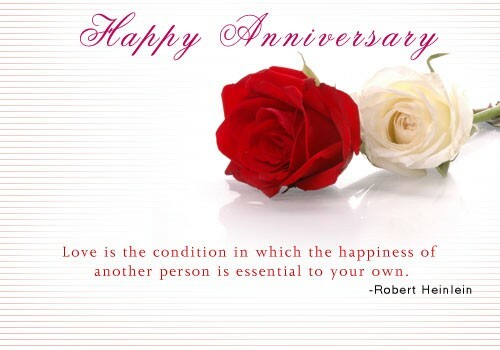 I wish you a very happy anniversary. Happy anniversary, my friends! Make sure to love each other even more than last year. Let this anniversary be a symbol of all great things the two of you have accomplished together in the last 12 months. Congratulations, my friends. I know that you are kind to each other, love each other and respect each other. And I wish you nothing more than that in the years to come! Love is about two individual parts joining into one piece. And I am glad that to see you in one piece this anniversary, too. Sometimes you can feel like you could not be able to live without someone else. I, on the other hand, feel that I could not be peaceful if the two you were not such a happy couple. Happy anniversary! I wish you one more year of love and excitement by my side, my love! Congratulations to you lovely couple! Happy wedding anniversary. They say that circle is perfect. I am thrilled to know that we live in a circled marriage, my dear. With each passing year, I feel like we are getting better as a couple. But how can it be possible when I feel that we were already the best possible? Happy anniversary, my love! 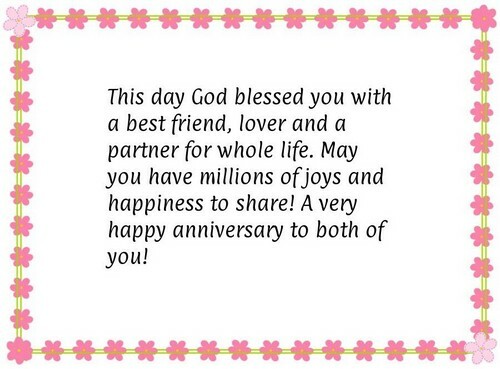 I wish you joy and satisfaction as you dedicate this day to all of the bright times you had in your marriage! Thank you for making me smile and being with me in the good days but most of all thank you for getting me out of all the bad times I had! Scientists discover new planets and new laws of the universe around us but they will never be able to explain the rules of this love I feel for you. Happy wedding anniversary, my dear. I don’t need the wedding anniversary present, I got one the day I married you, my silly darling! To think about you is to think of all the good things that have been already and all the good things that might happen in the future. I am not sure that I can comprehend so much happiness so I focus on this great day alone, my love! As years go by, my body is getting weaker but my love keeps me stronger for sure. Happy anniversary. All these years made me think for a while today and honestly, I don’t know how I lived through the years without you. On our anniversary day I have a feeling that our marriage is unique but with you by my side I know that each day is something special. I know our love will always be strong and rock-solid. But today I wish we make our love even more exceptional, my dear. If time is eternal then so is my love for you, darling. Happy anniversary. With you by my side, even the smallest things have huge meaning. Size and importance are irrelevant when we do things together. Doing nothing with you feels like doing everything; without you, everything I do feels like nothing. I wish we keep doing things together forever. Our marriage is just like the wine – it keeps getting better over years. Let’s keep drinking the wine of our love!